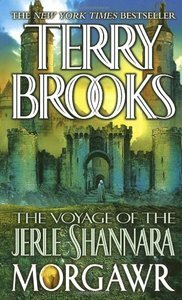 SYNOPSIS - The concluding volume of THE VOYAGE OF THE JERLE SHANNARA trilogy The quest of the airship Jerle Shannara at last draws to its climactic conclusion. The forces of good and evil, vying against each other to possess an ancient magic, race towards an explosive clash - and whatever fate awaits the victor...and the vanquished. Harrowing confrontations with the merciless Ilse Witch and the monstrous Antrax have already taken their toll on the intrepid heroes of the Four Lands, but their darkest adversary now snaps at their heels: the Morgawr - master of the Ilse Witch, feeder upon the souls of his enemies, and centuries-old sorcerer of unimaginable might. With a fleet of airships and a crew of walking dead men at his command, the Morgawr is in relentless pursuit of the Jerle Shannara and the crew that mans her. For the Morgawr, the goal is two-fold: to find and control the fabled ancient books of magic, and to destroy the dark disciple who betrayed him - the Ilse Witch. But the Ilse Witch is already a prisoner...of herself. Exposed to the awesome power of the Sword of Shannara, and forced to confront the truth of her horrifying deeds, she has fled deep into her own mind. Now at the mercy of those who seek vengeance against her, her only protector is her long-lost brother, Bek Ohmsford, who is determined to redeem his beloved sister and deliver her to the destiny predicted for her by the Druid Walker Boh. EXCERPT - She could hear them coming now, the scrape of their footfalls, the hiss of their breathing, and the rustle of their heavy cloaks, the echoes reaching out to her through the silence. Grianne slowed to where her own sounds disappeared completely, lost in the concealment of her wishsong's magic. She disappeared into the stone walls and floors of the ruins, into its towers and parapets. She completed the transformation she had begun earlier, taking on the look and feel of the castle. She disappeared in plain sight. FL Speak - The final chapter begins with the Druid's death. Too weary to carry on, Walker finally succumbs to his injuries in the last book. Bek carries the comatose Grianne to safety as the Morgawr chases them across the island. With Trulls as his protector, everything seemed fine until he was attacked by the very beast the Ilse Witch created to hunt them down. Trulls is mortally wounded and Bek is forced to make a decision between letting him die and turning him to a permanent shape-shifter. Meanwhile Morgawr and his minions are on the hunt for the other survivors. This books brings back Quentin in a major role as he comes to terms with the death of his closest friends. He was injured while trying to gather supplies that fell of the ship by a beast and was on the verge of death when Grianne woke up from her state and used the magic of the Wishsong to help him before going back to being unresponsive again. The depleted band of survivors survive attacks by beasts and mwellrets and make a dash to mainland when their ship runs into trouble and has to stop in one of the islands for repairs. It is here that they make a final stand. It is here where Grianne Ohmsford finally wakes up and decides to take her revenge on the Morgawr. This is the best book of the trilogy. Non-stop action to begin with and you every character has a pivotal role. You almost sigh in relief when you hear Rue finally acknowledging her love for Bek. You can feel the anguish of the Elven Prince, Ahren, when he learns of the news of the young seer, Ryer. The final battle is one of the best of the Trilogy, with Bek and Grianne fighting side by side against a much darker evil. In the end, Grianne is seen walking towards her new destiny of fulfilling Walker's ideas. She is the new Druid of Paranor. *shivers* Yes, this book is that good. More than magic, this entire trilogy had adventure in plenty. And that is what i wanted for a change.